Italian physicist, born at Como on the 18th of February 1745. He is celebrated as a pioneer of electrical science, after whom the volt is named. In 1774 he was appointed professor of physics in the gymnasium of Como, and in 1777 he traveled through Switzerland, where he formed an intimate friendship with H. B. de Saussure. 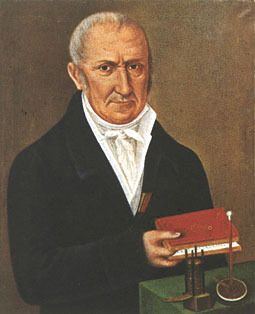 In 1779 a chair of physics was founded in Pavia, and Volta was chosen to occupy it. In 1782 he journeyed through France, Germany, Holland and England, and became acquainted with many scientific celebrities. In 1794 he received the Copley medal of the Royal Society. In 1801 Napoleon Bonaparte called him to Paris, to show his experiments on contact electricity, and a medal was struck in his honor. He was made a senator of the kingdom of Lombardy. In 1815 the emperor of Austria made him director of the philosophical faculty of Padua. In 1819 he retired and settled in his native town, where he died on the 5th of March 1827. Luigi Galvani had made in 1790 his historic observations on the muscular contraction produced in the bodies of recently killed frogs when an electrical machine was being worked in the same room, and described them in 1791 (De viribus electricitatis in motu musculari commentarius, Bologna, 1791). Volta followed up these observations with rare philosophic insight and experimental skill. He showed that all conductors liquid and solid might be divided into two classes, which he called respectively conductors of the first and of the second class, the first embracing metals and carbon in its conducting form, and the second class, water, aqueous solutions of various kinds, and generally those now called electrolytes. In the case of conductors of the first class he proved by the use of the condensing electroscope, aided probably by some form of multiplier or doubler, that a difference of potential was created by the mere contact of two such conductors, one of them being positively electrified and the other negatively. Volta showed, however, that if a series of bodies of the first class, such as disks of various metals, are placed in contact, the potential difference between the first and the last is just the same as if they are immediately in contact. There is no accumulation of potential. If, however, pairs of metallic disks, made, say, of zinc and copper, are alternated with disks of cloth wetted with a conductor of the second class, such, for instance, as dilute acid or any electrolyte, then the effect of the feeble potential difference between one pair of copper and zinc disks is added to that of the potential difference between the next pair, and thus by a sufficiently long series of pairs any required difference of potential can be accumulated. This led him about 1799 to devise his famous voltaic pile consisting of disks of copper and zinc or other metals with wet cloth placed between the pairs. Numerous examples of Volta's original piles at one time existed in Italy, and were collected together for an exhibition held at Como in 1899, but were unfortunately destroyed by a disastrous fire on the 8th of July 1899. Volta's description of his pile was communicated in a letter to Sir Joseph Banks, president of the Royal Society of London, on the 20th of March 1800, and was printed in the Philosophical Transactions, vol. 90, pt. I, p. 405. It was then found that when the end plates of Volta's pile were connected to an electroscope the leaves diverged either with positive or negative electricity. Volta also gave his pile another form, the couronne des tasses (crown of cups), in which connected strips of copper and zinc were used to bridge between cups of water or dilute acid. Volta then proved that all metals could be arranged in an electromotive series such that each became positive when placed in contact with the one next below it in the series. The origin of the electromotive force in the pile has been much discussed, and Volta's discoveries gave rise to one of the historic controversies of science. Volta maintained that the mere contact of metals was sufficient to produce the electrical difference of the end plates of the pile. The discovery that chemical action was involved in the process led to the advancement of the chemical theory of the pile and this was strengthened by the growing insight into the principle of the conservation of energy. In 1851 Lord Kelvin, by the use of his then newly-invented electrometer, was able to confirm Volta's observations on contact electricity by irrefutable evidence, but the contact theory of the voltaic pile was then placed on a basis consistent with the principle of the conservation of energy. Experimental physicists Auguste-Arthur de La Rive and Michael Faraday were ardent supporters of the chemical theory of the pile.